Nokia 6 hands-on hands on review | What Hi-Fi? Nokia is back! But can the midrange Nokia 6 make the impact it needs to? We got hands on to find out. It’s fair to say the global launch of the Nokia 6 wasn't the headline news from Nokia’s MWC 2017 press conference. That spotlight was stolen by the announcement that Nokia was relaunching the classic 3310 phone after 17 years. The rebirth of Nokia as a brand gets us feeling a little nostalgic. Now under the guardianship of HMD Global, the Nokia name is one of the most famous in mobile phone history, and there’s an unusual willing from just about everyone to see it succeed - especially now it's embraced Android as its platform of choice. 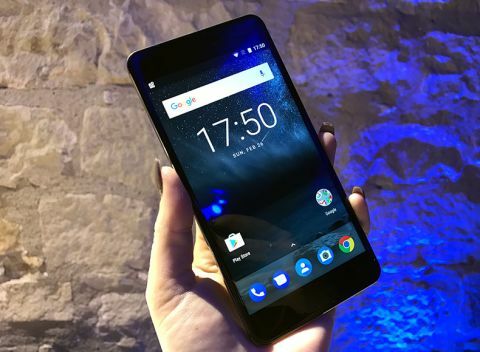 The Nokia 6 (or the 5 and 3, also announced) might not be a stand out phone that will go toe-to-toe with the big-name flagships, but it is a promising mid-range handset all the same. It certainly shows there could be plenty more to come. If there’s one thing you can say about the Nokia 6, it’s that it's really well built. There has been a lot of time taken to ensure this feels nothing like the cheaper mid-range phones it is competing with. It’s constructed from a single block of aluminium, each one taking 55 minutes to machine, not just giving it a premium feel, but a sturdy and durable one too. The edges on the back panel are ever so slightly curved, which helps it sit well in the hand, but it also features diamond-cut chamfered edges that help to give it grip. Following its launch in China in a choice of black, blue, silver and rose gold, the global launch leads with the Arte Black special edition. It packs a glossy black finish and improved specs, not to mention a higher price tag. The original will cost around £60 less at £195 compared to £255 for the Arte Black edition. Both feature a fingerprint scanner that was quick and accurate when we tested it. The front of the Nokia 6 is largely owned by its 5.5in full HD (403ppi) IPS display. This might not be the 2K display of Samsung’s Galaxy S7, let alone the 4K display of Sony’s XZ Premium, but it’s bright, sharp and looked very good indeed during our time with it. Even blacks looked pretty deep – not always a given with an IPS display. There’s no HDR support here like we’ve seen from a lot of MWC’s other smartphone launches, but at this price point, we wouldn’t expect it . Take one glance at the spec sheet and you’ll see mid-range phone staring back at you. Both the regular and Arte Black versions of the phone feature Qualcomm’s very middling (but fit for purpose) Snapdragon 430 chipset, with 3GB or 4GB of RAM respectively. The Arte Black also gets a boost in the storage department, offering 64GB to the regular version’s 32GB. There’s a microSD card slot on both though, so you can upgrade this as and when you need it. From a quick flick through the menus, things seem perfectly responsive and more than acceptable for this level. Power users might notice some slowdown during heavy multi-tasking and graphic-heavy games might struggle to keep back on occasion, but it should do just fine for day-to-day tasks. Elsewhere there is a 3000mAh battery keeping things running, a 3.5mm headphone jack and a microUSB for charging. The latter feels a little old amidst a growing sea of USB-C connectors, but it’s far from a deal breaker. On the other hand, a big plus is Nokia’s decision to use an almost stock version of Android, save for a few small tweaks here and there. This means a clean Android Nougat experience, similar to that on Google’s own phones. This also means compatibility with Google Assistant and Nokia has promised to offer monthly security updates to keep your data safe. As we’ve seen previously on Lenovo and Amazon tablets, Nokia is offering Dolby Atmos sound on the Nokia 6, with dual stereo speakers and a “smart amplifier” to power them. The promise is deeper bass and unmatched clarity, and from a quick listen on the show floor, it certainly seems promising. We heard a Dolby Atmos demo through a pair of Sennheiser over-ear headphones, and it certainly sounded loud and powerful. There was plenty of bass, a clean, clear midrange and a decent virtual placing of sounds. A much more critical opinion in better circumstances will have to wait for our full review – but for a midrange phone, it didn’t sound bad at all. The two cameras on the Nokia 6 are rather contrasting affairs. On the back there's a fairly run-of-the-mill 16MP camera with not much to shout about other than its decent pixel count for the price. There’s no Carl Zeiss lenses here from the brand’s Lumia days. On the front though, the camera has been bumped up from the Nokia 6 that was originally launched in China. It’s now 8MP, wide angle and features autofocus for sharp selfies – the latter in particular being quite unusual at this level. We had a quick look at both during our hands on time, but not long enough to get any real feel of their abilities. The camera app certainly looked clean and easy to use though. We’ll tell you more in our full review. It’s often hard to get as excited about midrange phones as it is about the flashy flagships, but the Nokia 6 shows plenty of promise. There are few phones at this price that look as good as the Nokia 6, and with stock Android and a decent mid-range chipset, all signs point to a good little performer too.